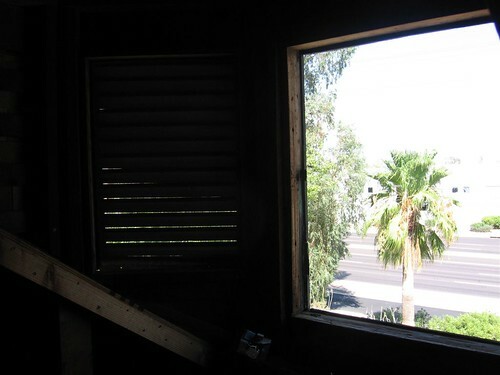 the attic window (front), originally uploaded by Blair Necessities. we had five trees down, three we could save... no power for a day and I was sick sick sick through the whole freaking ordeal to boot. the attic - yeah... see the picture, there used to be a four paned window there, but it got knocked out in one of the storms. We got an estimate yesterday on fixing it and the one in the back with lost a frame and we are looking at a $2000 bill... [insert expletive here]. I am not sure what we should do, that is a lot of money for two windows... we are looking for carpenters the seek out other bids but they are often turning us down when they hear the request of attic window on an old house. In spite of this headache, I do love the house. Oh and on the positive side of old house hell, or maybe not... there is a rock band interested in taking a picture of them on our front porch for their new album... though we have granted permission, we have not heard back from them. Sounds like you should definitely invest in a dehumidifier in case of any other future mishaps!